The Future Business Leaders of America chapters at Arkadelphia High School and APSD’s Goza Middle School will be wrapping up their t-shirt fundraiser for Breast Cancer Awareness this week, but will still be promoting their Mobile MammoVan project in conjunction with UAMS which will take place at AHS in October. 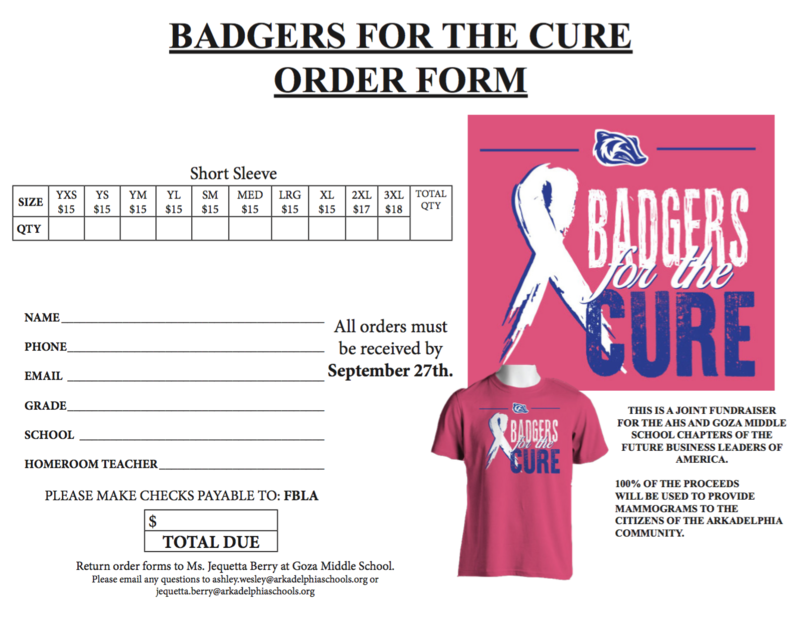 The chapters, under sponsors Ashley Wesley (AHS) and Jequetta Berry (Goza) are selling pink “Badgers for the Cure” t-shirts and will be asking fans to wear the t-shirts to the annual Badger football “Pink Out” game on Friday, October 12, in conjunction with Homecoming. T-shirt orders must be received by Thursday, September 27, to ensure their availability to wear at the football game. This link will take you to a PDF version of the order form. All proceeds from t-shirt sales will go to the UAMS Mobile MammoVan program, which travels to different locations and gives free mammograms to women age 40 and over who are due for a mammogram. Fundraisers such as the t-shirt fundraiser conducted by AHS and Goza FBLA help offset costs needed to enable the program to travel to different locations and provide free mammograms. “We really wanted to make this year’s “pink out” effort more than just buying pink t-shirts,” said Wesley. “When researching ways to do that we discovered the UAMS Mobile MammoVan and pursued that option. UAMS will be providing the service in Arkadelphia on Wednesday, October 24, from 9:00 am – 2:00 pm at Arkadelphia High School. The AHS and Goza FBLA chapters will host the event as one of their community service projects. An appointment is required for those who wish to participate and those interested can call UAMS Mobile Mammography at 1-800-259-8794 to make an appointment. The mammograms are provided free of charge to those who get an appointment, even if the participant does not have insurance. For more information on the t-shirt fundraiser or the Mobile MammoVan event, contact Wesley at ashley.wesley@arkadelphiaschools.org or Berry at jequetta.berry@arkadelphiaschools.org.